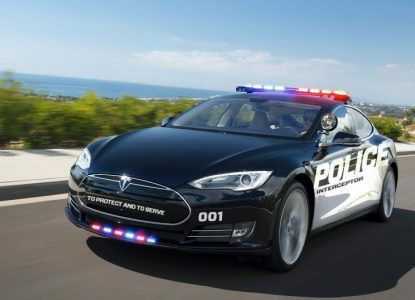 Fremont, CA is the First U.S. City with a Tesla Police Car. While driving In Fremont, CA the car with flashing lights behind you could be a Tesla. The Police vehicle is a used 2014 Tesla Model S 85, and most likely will be first on patrol in U.S.
Fremont is the home of Tesla’s manufacturing plant and where the Fremont Police will soon be patrolling streets with a customized black-and-white all-electric Tesla Model S.
10,000+ employees work at the Fremont Tesla manufacturing plant, after all it’s the cities largest employer.